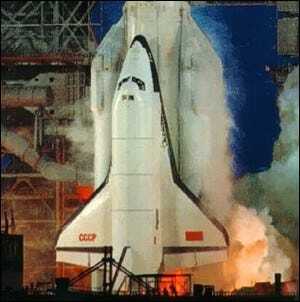 Buran, Russian for “snowstorm”, was the Soviet response to the US space shuttle program. The Buran Program was short lived, but it did produce one of the more notable space-based achievements of the 20th century. Launched on 15 November, 1988, it was the first successful launch and reentry of an autonomous space plane. Buran entered Earth orbit–assisted by an Energia rocket–to this day the largest liquid-fueled rocket ever built–circled the planet twice, and returned to Earth with a successful airstrip landing without the intervention of a single cosmonaut (as there were none on board). The landing was remarkably precise, despite high winds on reentry Buran came to rest a mere 9.8 feet laterally and 33 feet longitudinally from it’s projected landing point. Due to the collapse of the USSR the Buran program was moth-balled and, in an unfortunate accident in 2002, the Buran itself was destroyed when a poorly maintained storage hanger caved in upon it. Buran remains the largest autonomous space plane ever developed (weighing in at 231,000 pounds with a full payload) and for nearly 22 years was the only autonomous spaceplane launched–in April of 2010, the Boeing X-37 became the second spaceplane to successfully complete a fully autonomous Earth orbit and reentry.